The Mission Bay Preservationists have been selected to perform and represent San Diego in its sister city Yokohama, Japan in April of 2017! 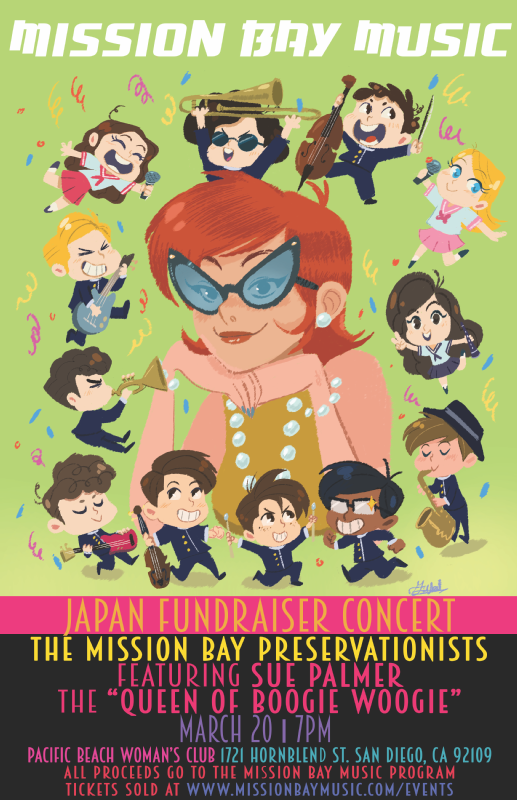 San Diego’s Boogie Woogie Queen, Sue Palmer, headlines a March 20th fundraiser to help the nationally known Mission Bay High School Preservationists jazz band to raise the remaining funds needed for its April performances in Japan. Join us for a night of music, food and fun! Chef Carlos Delgado will be cooking up his famous paella for the event. Come hungry! Doors open at 6:30PM. Concert starts at 7:00PM. This is a family friendly event. We will have food and adult beverages.